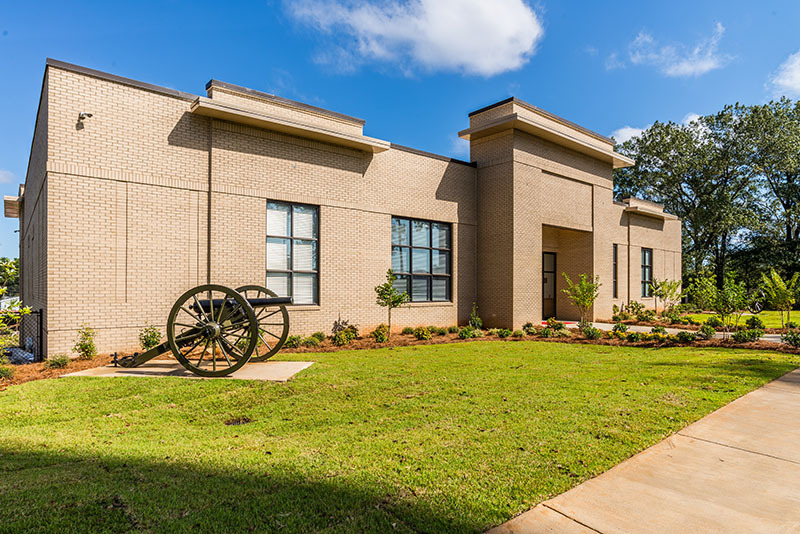 The Military Science Department Building is the newest facility on the Milledgeville campus of Georgia Military College (GMC). The addition of Military Science Department Building is part of the college’s commitment to the continued growth and improvement of its cadet and ROTC programs. GMC’s intent is for the new building to “facilitate interaction between the Military Science Department, the GMC Corps of Cadets staff and students by bringing expanded classroom and training space adjacent to cadet living quarters and program offices.” Within this one-and-a-half story structure is housed four state of the art classrooms, a cadet workroom, an administrative office, three private offices, two 4- to 6-person offices, as well as a conference room, a reception area, a recruiting office and a break room for the cadre. The classrooms are designed to accommodate multiple uses and needs through the use of folding partitions that can make the rooms larger or smaller. It is wood and structural steel construction with a brick exterior and covered by a TPO membrane roof. Terrazzo tile and carpeting cover the floor throughout the facility. An elevator accommodates accessibility needs between the two levels of the structure. The site selected for the Military Science Department Building required significant work. An approximately 20 feet high by over 100 feet long modular block retaining wall was built to support the site for the new Military Science Department Building.